John Deere's new scrap and rock grapple buckets are all ideal for a range of jobs, from disaster cleanup to scrap handling. John Deere has announced that it is expanding its line of job site cleanup solutions with a series of new grapple buckets. The new GS66B, GS72B, GS78B, GS84B scrap grapple buckets and GR72B and GR84B rock grapple buckets are all ideal for disaster cleanup, scrap handling, and other job site cleanup applications where grappling power is necessary. Each unit includes two-independent-action grapples. These allow different-sized objects to be picked up in each grapple. A 620-mm (24.4-inch) wide grapple arm and grapple stance width of 1,540 mm (60.6 inches) on the GS66 and GS72/GR72 and 1660 mm (65.3 inches) on the GS78 and GS84/GR84 units allow for easier grappling of wide materials, in particular. Bolt-on side plates are available for scrap applications when containing the material is necessary. The scrap grapple models also have predrilled cutting edges for optional bolt-on, replaceable edges. 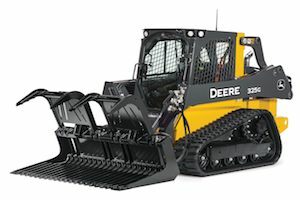 "During critical times, like disaster cleanup, operators need powerful and reliable attachments that won't let them down," said Jessica Hill, program manager, global attachments, John Deere Construction & Forestry. "We are delivering industry-leading reliability with these new buckets, and feel confident that customers will find that they can move the most difficult, irregularly shaped materials with ease and speed." All of these attachments are compatible with select John Deere G-Series skid steers and compact track loaders, L-Series compact wheel loaders, and other competitive models. More information on these grapple buckets can be found by visiting www.JohnDeere.com or by contacting your local John Deere dealer.